Hey, check that out! For the first time ever, we've got the Fantastic Four teaming up with the X-Men! And so soon after the two-part tale featuring the FF's adventure with the Avengers in #25-26. (Heck, there was only a single issue separating that story from this one!) By now, Stan's figured out that the best way to sell these new titles is through ample cross-promotion - and with the FF being the flagship title in his stable, that's clearly the book in which to do it. Sue's almost right. It's actually the Avengers who fought the Space Phantom! And speaking of success - you have to admit that's a great visual Jack Kirby's conjured up for the cover. Let's face it: the Awesome Android is a great visual period, and one that's far more eye-catching than that of the Thinker (despite the fact that the Android hardly appears). 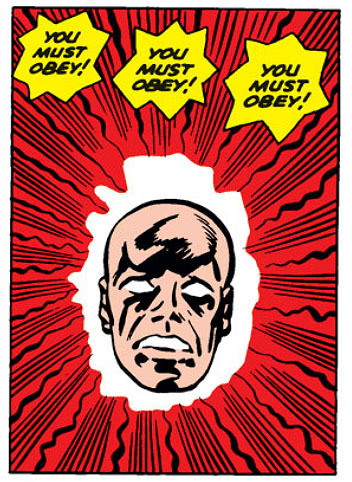 And Jack must have realized this too; after all, contrast the cover above to that which graced the Thinker's first appearance in Fantastic Four #15. There's simply no comparison! Um. Wouldn't adding more clay just make the puppet look like the Blob? Continuing to focus on the cover for a moment, it's not just the art that's a resounding success, as even the copy holds its weight. 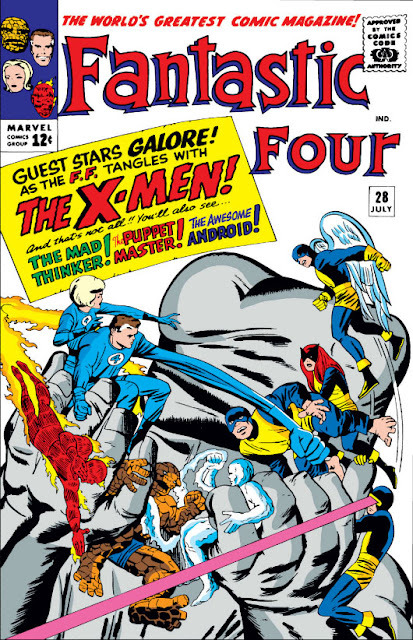 A potential reader wouldn't even have to look within to glean that the story inside must be an absolute pile-on: The Fantastic Four AND the X-Men, AND the Thinker and his Awesome Android ... AND the Puppet Master too??? Whew! And yet it's notable that the villains are exclusively FF baddies, and not (as would often feature in later team-up stories) a pair for each of them - like, for example, Magneto and Doctor Doom. Usually in these face-offs, the two token females are matched up. But here, Marvel Girl takes on the powerhouse that's The Thing! Nice. Previously, it had been a bit of a surprise to see a story open with a reference to another book. Well, here it goes even further, as we start with a footnote to a previous story on the very cover! And if that's not enough, the story begins with a recap of that adventure; not the most striking way to kick off a story. What's worse, the recap doesn't end until the bottom of page 3! And, y'know, when you've only got 14 pages to tell your story in the first place, that's not a very economical approach. 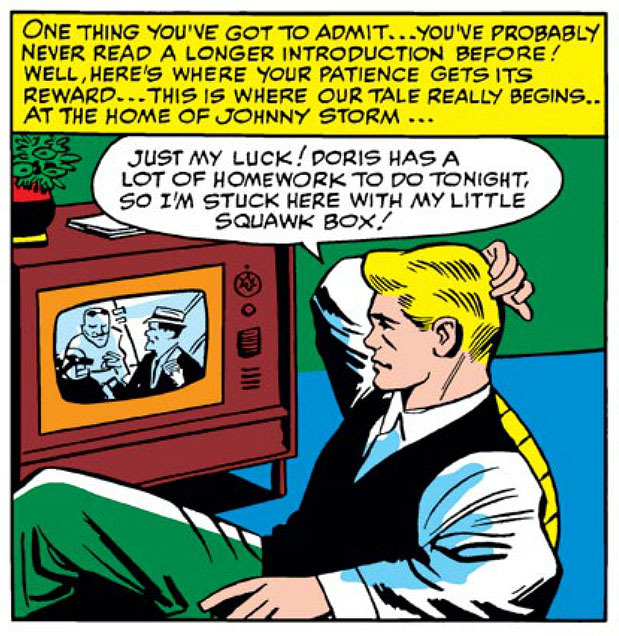 Did Stan realize too late there wasn't that much story in the Terrible Trio's return, and was just stalling for time? 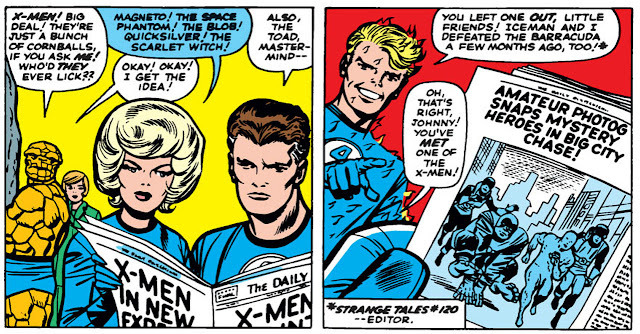 Even Stan's aware of this story's excess. 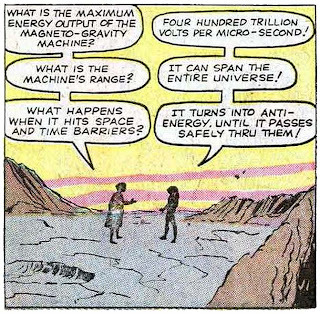 A somewhat rare occurrence of the Marvel characters breaking the fourth wall. into the green design of Nightmare's garb. Snazzy! 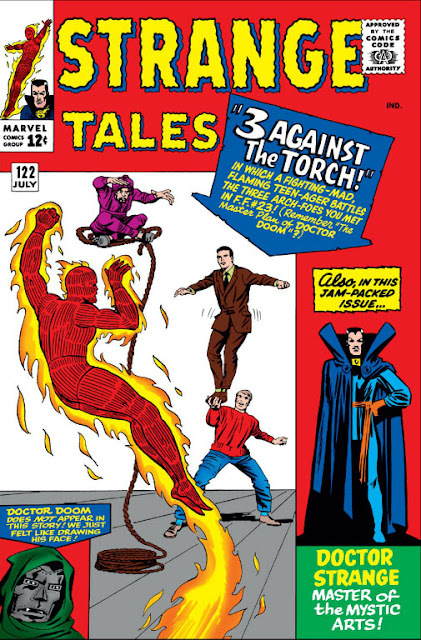 Meanwhile, the Doctor Strange back-up story makes an odd misstep at its beginning, when the Doc falls asleep to find himself in a different dimension, being attacked by magicks and sources he can't predict. It soon turns out to be Nightmare, of course - and yet it seems odd that even this small bit of suspense at the identity of his attacker is telegraphed by the opening splash page of the story, which identifies Mr. Mare as the villain of the piece. You may recall that a similar predicament occurred in The Amazing Spider-Man #13, when the mystery of the crime-committing Spidey was spoiled by the cover appearance of the new villain. But there, it was understandable - because Mysterio has an incredibly eye-catching design, and his appearance on the cover might have sold more copies than not. Here, though, there's no excuse! And that's a shame, because although the story isn't a bad one, it's also not the most distinctive - and that bit of mystery at the beginning could have gone a long way towards imparting just a bit more flavor to the tale. And so concludes the Mandarin two-parter we left Iron Man in last time. Regrettably, it turns out that most of the interesting bits were in the story's setup in part one; this really is just an action piece by comparison. Iron man manages to break free of the Mandarin's trap (of course) and then they fight for a bit - with M using disintegrator rays, illusions, tractor beams and more. Really, the most notable point is at the climax, when Tony smashes all of the villain's equipment before he leaves - America's stolen missiles reclaimed - and the Mandarin, thwarted, swears ever-lasting vengeance. 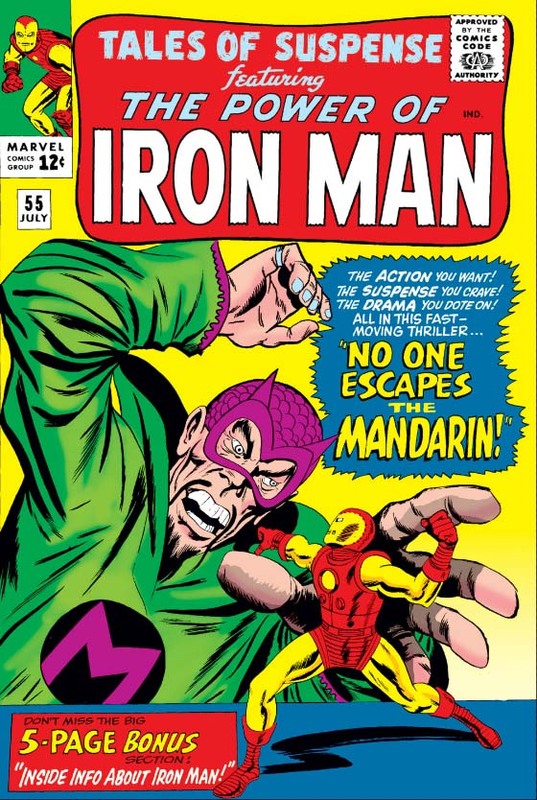 Finally we see the beginning of the Mandarin's obsession, and the first few steps on his road to becoming Iron Man's "big bad". I suppose this is comedy? between Happy & Pepper, this really is churlish behavior. Unfortunately, the bonus feature this month is really just a lot of filler in its own right. 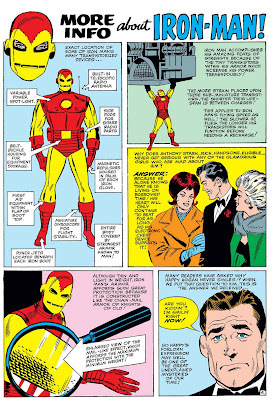 The first page is just a splash, with a shot of Iron Man standing in front of various of his villains. This is followed by a two-page explanation of donning his armor - which would be more interesting if we hadn't already seen that very thing just a few issues ago. 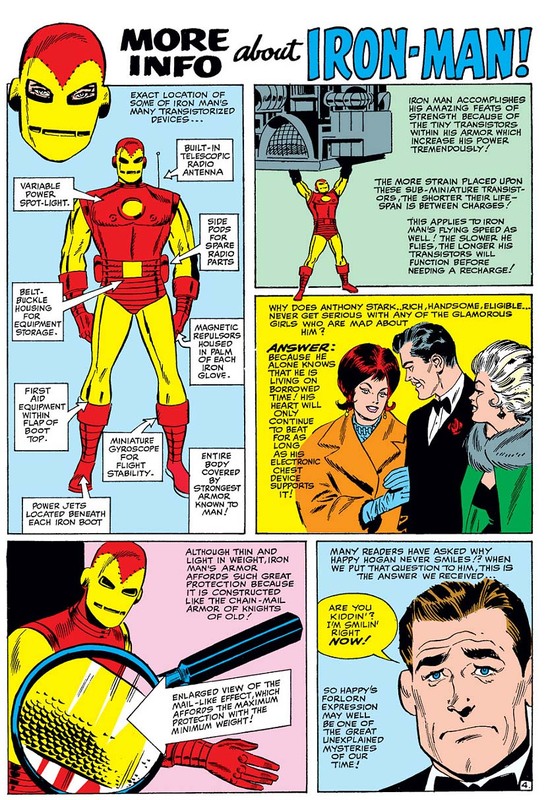 A one page "more info about" does actually give some better insights into the man and the machine, but the piece is then rounded off with a "Pepper Potts' Pin-up Page", showing nothing more than Potts posing for Happy Hogan on a beach. 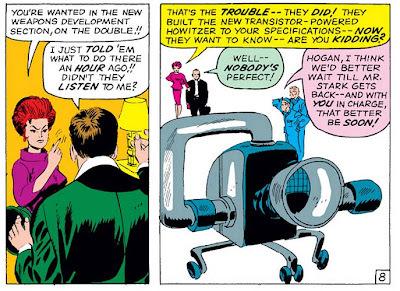 Unusually, the text itself acknowledges the change in her appearance: "When first introduced in "Tales of Suspense" Pepper had been a perky, pug-nosed, freckle-faced imp! But, after she realized how Tony Stark feels about glamorous females ... Pepper went to her beauty parlor and 'shot the works!' Today she's one of the most gorgeous females in comics or anywhere else!" Meanwhile, the backup "Tales of the Watcher" is amusing. One day, while the Watcher is gazing at the Earth from his home on the moon (now identified as his temporary domicile, definitively clearing up a bit of confusion), a bug-eyed alien lands and explains his plan to steal the Earth's sun, needed to replace his homeworld's star which is now dying out. Aware of the Watcher's oath to not interfere, the alien happily answers all his incessant questions, knowing there's nothing the enigmatic being can do to stop him. As it turns out, however, the Watcher had realized that the alien had parked his craft on a bog (a bog?? On the moon?? ), and was delaying him just long enough for the ship to sink - taking with it the alien's sun-stealing apparatus, as well as all his communications. Desperate, the creature begs the Watcher for help, explaining that without his ship he can't call home for help, and will die when his limited air supply runs out - but the Watcher, unmercifully, reiterates that there's naught he can do ... but watch. The Watcher pulls a filibuster.